Maybe the saddest case of inquiry into the descent of a person in Meppel concerned Henny Mildenberg, married to Willem de Wilde. She was born in Bentheim in Germany on 2 June 1902 and Willem was born in Hillegersberg on 12 February 1898. In the thirties Mr. de Wilde was appointed ‘crisis official’, a function that was created in 1933 after the crash on Wall Street made itself felt in The Netherlands too. The Colijn administration began to support people in need. In order to prevent abuse crisis officials were appointed who had to see to a correct implementation of the measures to support people. After the country had been occupied by the Germans, these officials had to supervise the new distribution measures. 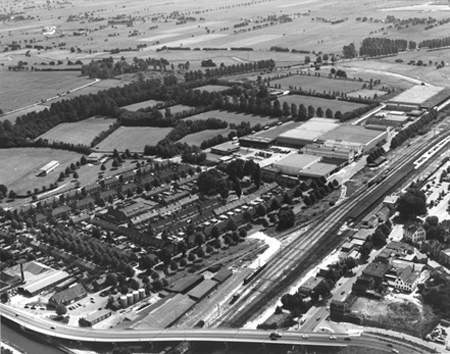 Willem first worked in Hoogeveen and later in Meppel. On 29 June 1940 he married Henny Mildenberg. They came to live at 28 Ezingerweg and later at no 31 in Meppel. Henny had been married before to Adriaan Visser, from which marriage a daughter, Veronika, was born in Rotterdam on 8 January 1931. In August 1941 Veronika moved from Driebergen to Meppel to come to live with her mother and stepfather. After her parents had been deported to Westerbork, she moved back to Rotterdam. Only after the war she came back to Meppel. For more than two years there was a tug-of-war between the De Wilde family, Meppel local council and the Registry Office about the descent of Mrs. De Wilde-Mildenberg. What was the matter? When in February 1941 the Jews in Meppel had to register according to regulation 6/1941, the Registry Office also received the forms of Mr. and Mrs. De Wilde. On Willem’s form it said he had two Jewish grandparents. On his wife’s form it said ‘unknown’ in that particular column. This of course needed further investigation. 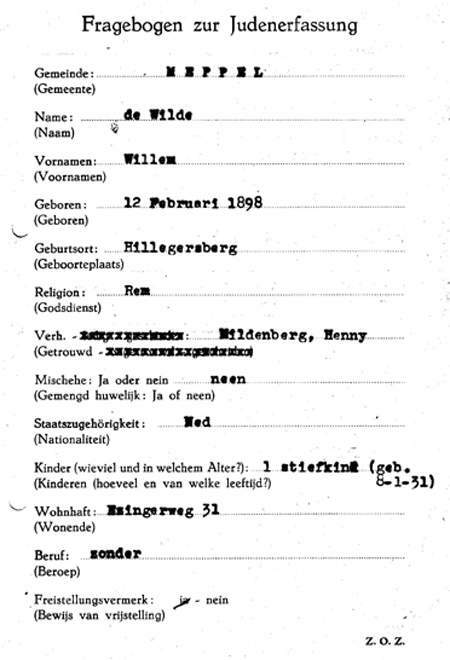 Apparently the Registry Office could not work it out, for in a letter of 29 April 1941 to the local authorities in Meppel they stated they were still not sure about the descent of Henny Mildenberg. Mr. and Mrs. De Wilde were summoned to come and see the authorities. In a memo it said: ‘Mrs. De Wilde’s paternal grandparents are both Jewish, according to a report from Bentheim. Her maternal grandparents are still under investigation’. By this uncertainty the officials did not know how to fill in this form exactly. Mayor Wisman decided that a ‘J’ should be put on her identity card, as she had two Jewish grandparents anyway. The ‘J’ was also put on her husband’s card, as he was married to a Jewess. A period of great uncertainty followed. The Registry Office kept a close eye on the proceedings, Meppel council urged the family to take action, and the family tried desperately to be safeguarded against the statement that Mrs. De Wilde had four Jewish grandparents with all its consequences. The problem was that there was never any notice from the council of Witmarschen in Germany about the descent of the maternal grandparents. It appears now that a mistake was made when the people concerned filled in their forms. There has been some correspondence about this when I was absent (replacing somebody at Social Services). I noticed that on the identity card of Mr. de Wilde, husband of Mrs. De Wilde-Mildenberg, who is the person concerned, a ‘J’ has been put, although it is still not certain that she is a Jewess, because they cannot get information about her MATERNAL grandparents, whether they were Jewish or not. As long as this question has not been answered, we cannot state she is a Jewess, for MR. DE WILDE is NOT a Jew himself. It is certain that they are both of mixed blood, but this does not make them JEWS. At the most we can put ‘GI’ on the card. It will be clear to you that on the answer to the question above depends their being JEWISH, BOTH of them. If Mrs. De Wilde’s maternal grandparents are no Jews then she nor her husband are Jews, but of mixed blood, so that there should not be a ‘J’ on their cards but ‘GI’, as neither of them belongs or belonged to a Jewish religious community, nor is either of them married to a Jew. The above mentioned mistake seems to be that on the form question d ‘Married a Jew after 9 May 1940?’ the answer given was ‘yes’. I am not sure about this as I have not seen the form myself. The question about the number of Jewish grand parents could not be and still cannot be answered satisfactorily. I feel certain that the definitive indication ‘J’ on both their cards is INCORRECT, and should be written in pencil for the time being. The mistake was possibly made because they were both married after 9 May but not to a Jew(ess). The angry mayor was forced to back down. On both their cards the ‘J’s were written in pencil. I cannot fill in question number 9 with certainty and truthfully, as I am not certain that I have four Jewish grandparents (although I regularly applied to the German institutions for this information). As far as I know I had 2 Jewish grandparents; that they belonged to a Jewish religious community does not appear from the information I got about this matter. Besides I am not married to a Jew, so that the indication ‘J’ on my identity card is incorrect. Having received your letter I first have to inform you that I cannot comply with your request to hand in my registration card for further adjustment, because of the fact that I have submitted the matter once more to the Ministry of Home Affairs with the evidence of a copy of my certificate of baptism of the Remonstrant church, proving that I have been part of this religious community since May 1898. Furthermore I would like to draw your attention to the fact that my wife cannot answer truthfully question number 9 of the registration form, concerning the statement that she has 4 Jewish grandparents. Mayor Wisman would not hear of this. He informed Mr. De Wilde that he had to have a ‘J’ put on his identity card before 7 September otherwise he had to hand it in. So Mr. De Wilde was forced to go to the town clerk’s office. So: in spite of the fact they did not have any proof of the fact that Mrs. De Wilde descended from four grandparents, they informed the Inspectorate they had a mixed marriage. Meanwhile Willem had been dismissed from his job at the department of Agriculture and Fishing. They were pursued by misfortune. A further investigation is carried out about the person concerned and till the outcome of this she and her husband can stay in Meppel with permission of the Kommandant der Sicherheitspolizei in Assen. 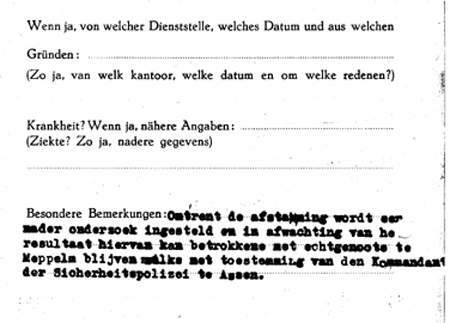 At the end of 1942 Meppel local council had to report on a Fragenbogen why the De Wilde family was still in Meppel. The outcome of the investigation was received by Meppel council on 24 May 1943. In spite of the fact they had been assisted by a lawyer A.J.Fokker LL.M, it was not what the family had hoped for. In the meantime Henny and Willem had been transported to Westerbork on 15 March. Even there Henny stuck to her refusal to fill in a ‘4’ after question number 9, saying she would then make a false statement. Her tenacity has proved successful, for she was one of the few Jews from Meppel who returned from Westerbork alive. At Westerbork Mr. and Mrs. De Wilde were put up in a barrack reserved for people who were baptized Protestants, for Mr. De Wilde was a baptized Remonstrant. Compared to other Jews in the camp they managed reasonably well for a while. There was even Christian education and religious services could be held. As a pulpit they used the top bunk bed with a white sheet over a cross beam. Westerbork was not their last place of residence, however. On 4 September 1944 Willem and Henny de Wilde departed on the last big transport to Theresienstadt; the same transport Leo Westreich was on. Many ‘prominent people’ were on this transport to the East: medical staff, the cabaret people, Jews with a ‘Sperre’ and those baptized Protestant. There were altogether 2086 people in the waggons for transporting cattle. In Theresienstadt the De Wilde family celebrated the liberation. After their return to Meppel they had to look for temporary accommodation, as their house had been let. At first they lived for some months with a family at 9 Commissaris De Vos van Steenwijklaan. On 11 June 1945 they got permission from mayor Mackay to live in with Mrs. Van Hulten at 1 Oranjelaan. From 3 August 1945 they lived there, at first with Mrs. Van Hulten and later on their own. By the end of 1946 their daughter Veronika came to live with them. She left Meppel again in April 1952. Henny de Wilde had a very special profession: she visited ladies at home to measure them for a corset. She died in Meppel on 23 May 1957 at the age of 55. Her early death may have partly been caused by what she had gone through in WWII. We do not know whether Willem took up his old profession of CCD official, nor when he left Meppel. The De Wilde family lived on Ezingerweg by the railway.